The last two weeks have been a whirlwind of activity and travelling for me, with not a whole lot of time to take it all in and mull over everything. It started with my trip away from the family to attend the 25-year Stampin’ Up! convention. I met lots of people, saw a lot of stampers who are far more obsessed than I am, and had some fun getting inspired by all kinds of neat projects. There were parties, there was the chance to play with new products, and there was nail polish in Stampin’ Up! colours. Yep, nail polish heaven for me! I shared a hotel room with 3 other demonstrator friends, which meant I had some built-in company. The experience wouldn’t have been as good if I’d gone all on my own. I will admit that I dropped the ball a bit on my workouts, but I did make it to the gym for a quick half-hour workout! This card was my swap card. I made 10 of them to trade for others’ creations. Great fun! See that pretty Strawberry Slush (the pink colour) flower and ruffled ribbon? Yep, I got to put on nail polish in that colour. 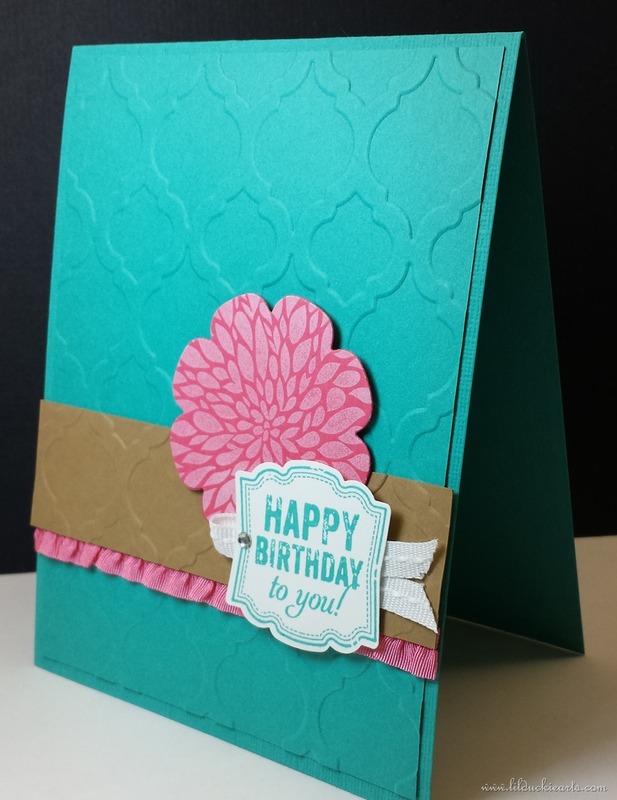 Bermuda Bay, Whisper White, and Baked Brown Sugar Cardstocks. Whisper White and Bermuda Bay Stamp Pads. Label Love and Betsy’s Blossoms Stamp Sets. 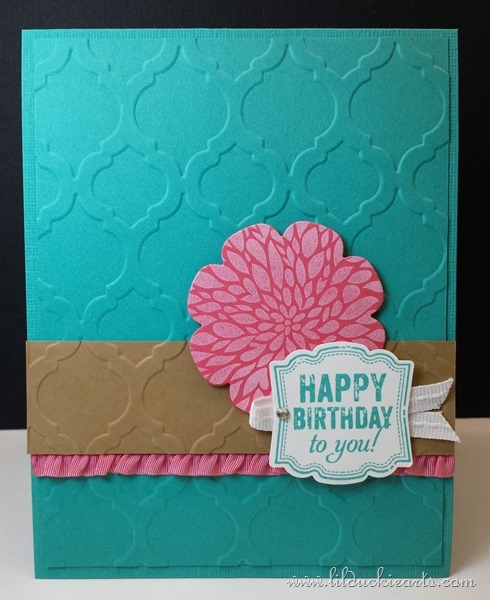 Big Shot and Modern Mosaic Embossing Folder, and Floral Frames Framelits. Strawberry Slush Ruffle Stretch Trim, Whisper White Stitched Grosgrain Ribbon, and Rhinestone Basic Jewels. This entry was posted in birthday, card and tagged birthday, card, swap. Bookmark the permalink.